Three routes, three flavors. We're returning to our roots and that is to emphasize the beautiful Middle Tennessee area. You can choose the 75 mile route and enjoy the challenge of climbing Monteagle, take the shorter 52 mile route (no mountain) or if you're just getting your feet wet take the 12 mi. Whichever route you choose, rest assured you won't be disappointed in the experience. For your convenience a map, cue sheet and GPS data for each route can be downloaded. Just click your chosen route under "Details, Details" and then the corresponding button. Yes! we're returning to the mountain. 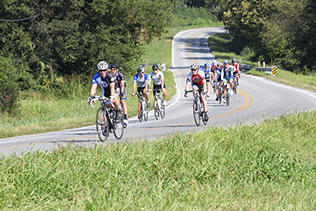 The 2.6 mile, demanding climb up to Sewanee was a signature feature of the ERV 100 and in 2018 it will be again. This route begins with and traverses the same roads as the 52 mile route through the first 25 miles. At that point the shorter route splits off and you’ll be heading to the mountain. You'll start the climb up the mountain in earnest at about 30.9 miles. The first 0.8 mile or so is nice and gradual but hang on the next 0.4 mile is a gut wrenching grind. If you're still upright, you've got another 1.4 miles to the top. Yep, it's tough but satisfying and after a small market stop in Sewanee the 3 mile descent will make you grin from ear to ear. Around the 47.4 mile point you'll loop back into the 52 mile route and finish your ride along with the riders on that course. There are five small markets with restroom facilities along this route where you'll be able to purchase snacks and drinks. This route is a pleasant loop that passes through the historic little town of Estill Springs and encircling nearly the entire Woods Reservoir. Many years ago Estill Springs was a "small-scale spa town" due to its abundance of mineral springs and the fad of mineral waters as a health remedy. Woods Reservoir was created by the military for use as cooling water for the Arnold Engineering Development Center. The 52 and 75 mile riders follow the same route up to about 25 miles. When they head off to the mountain you'll turn towards Woods Reservoir happy in your decision to avoid the mountain. There are three small markets with restroom facilities along this route where you'll be able to purchase snacks and drinks. This route is perfect for a nice little hour or so jaunt in the country. It's nearly flat with just a few rollers to make sure you don't forget you are in Middle Tennessee. About half way there is a small market with restroom facilities where you'll be able to purchase snacks and drinks. *Aproximation from Ride With GPS . Presented by Highland Rim Bicycle Club.